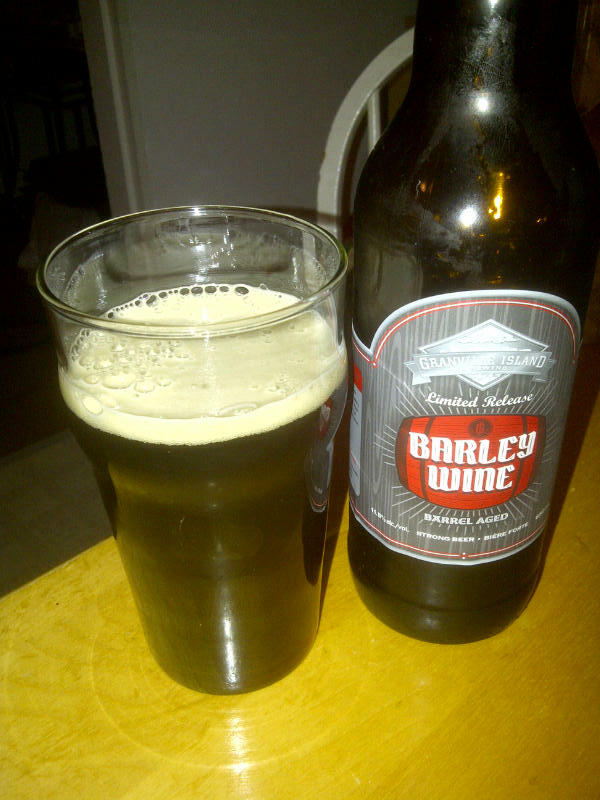 From Granville Island Brewing located in Vancouver BC comes their Winter seasonal “Barley Wine 2012” the breweries first Barleywine. Like all Bombers (650ml bottles) produced by Granville Island Brewing this beer is actually brewed on Granville Island not brewed elsewhere. This barleywine has been aged for a period of time in Bourbon barrels to add to the flavour. The beer pours a deep brown colour with a tan head. The aroma consists of dark fruits, grapefruit, cherries, hops and maybe a hint of malts. The flavour is composed of dark fruits, bourbon, oak, citrus, cherries, sweetness with some good alcohol present. Some will think this barleywine is a bit to sweet. The alcohol content of this beer is 11.5% with an IBU of 60. This beer was part of Mikes Craft Beer’s Barleywine Tasting. I personally really like this barleywine but I was overruled by the others at the tasting. I would like to thank Granville Island Brewing for helping me acquire this Barleywine for my tasting. This entry was posted in Barleywine Ale, Barrel Aged, Imperial and tagged barleywine, barleywine tasting, barrel aged, bc, beer, bitter, bitterness, bourbon, canada, cherries, cherry, dark fruit, dark fruits, granville island, granville island brewing, grapefruit, hops, hopy, imperial, malt, malty, molson, oak, oak aged, tasting, vancouver.